One of the first warnings I give to new concealed carriers is that they should be prepared to be less comfortable than when unarmed. It quickly becomes apparent that carrying a gun for self-defense is a bit of a hassle. But some people are surprised. Few people carry concealed consistently, because after a while the “cool” factor wears off, reality sets in, and suddenly carrying a gun every day is a literal and figurative pain in the rear. Even most of us die-hards might admit to having the occasional day or two when we don’t carry (though the naked feeling usually cures that). “Habituation” is a term used in psychology. It describes our tendency to ignore a stimulus when repeatedly exposed to it. Like how people who live near train tracks often tune out the loud trains passing. This means that if you just give it some time, gradually you’ll get used to the feeling of carrying a pistol, and soon you won’t realize it’s there (at least until you need it, hopefully). 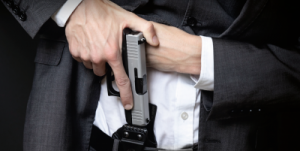 While concealed carry is less comfortable than not carrying, there are some options to decrease the discomfort to a more manageable level, which will in turn help to encourage you to carry more often, if not all the time. It’s nice to have a barrier between your skin and the gun. I personally don’t appreciate the feeling of cold gun metal pressed against my skin. I like to keep the undershirt tucked behind the holster and then put my concealment shirt on over the top, untucked. A quality gun belt is a must. You should consider it an essential piece of equipment just as important as the pistol and holster you choose. 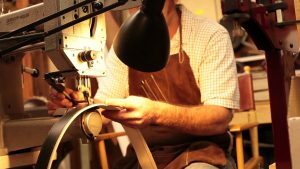 It doesn’t have to be leather, but if it is, make sure it’s made by a reputable craftsman from top quality, full grain leather. The “Genuine Leather” belts one might find at places like Wal-mart are not good enough. Buying quality is a worthy investment into longevity, and functionality, and can greatly improve the comfort for carrying concealed. Just make sure the belt is wide and stiff enough to provide a good base to hang your pistol from. As most know, Kydex is the brand name of a thermoform plastic that many holster companies use today. When heated to a specific temperature the plastic becomes malleable for easy production of functional holsters. Being plastic means it is not as conducive to carrying your pistol comfortably against your skin. If the holster is from a reputable company, the edges will be smooth and rounded to reduce friction. 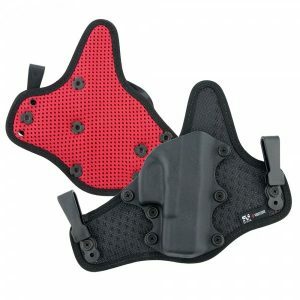 Some holsters have a padded mesh that encourages air flow between you and the holster. Companies have varying degrees of success with this, so reading reviews by users is beneficial when trying to decide which is right for you. Leather is a natural product and a supple leather feels great against the skin. However, a leather holster can become a significant safety risk. You might experience a reduction in trigger isolation as the leather breaks in. If you decide to go with a leather holster, make sure you check the holster frequently to ensure the trigger of the pistol is well protected. The holster itself can soften around the trigger guard to the point where it can press against the trigger and set off the pistol. It’s happened before so be aware it’s a possibility. The size of the pistol you carry will significantly impact the level of comfort that can be achieved. Obviously, the larger the pistol the harder it is to conceal. However, thought should be put into what tradeoffs you are personally willing to make. There is no such thing as the perfect gun for all situations. There is only the optimal gun for a given situation and person. These details can vary greatly, and it comes down to balancing pros verses cons. The smaller the pistol, the easier it might be to conceal, but caliber and capacity is also important. 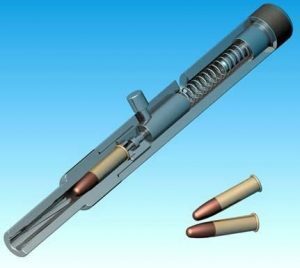 It may be easier to hide a single shot .22 caliber pen gun, but the defender will be severely limited past a first-round engagement that might well have to be a contact shot in order to be effective. Pen Gun, easy to conceal, hard to fight with. On the other side, carrying a Desert Eagle also might not be the right option. This is why most people tend to meet in the middle. Small to medium sized concealed carry pistols are generally preferred by most because they tend to balance these issues the most appropriately. The size of the person may also impact the size of pistol that can be comfortably carried. Larger body types can conceal larger guns but those with smaller frames may not be able to do so easily. Again, this comes down to personal preference more than anything. I know many guys well over 200 pounds who carry sub-compact or pocket guns and 105 pound mothers who comfortably carry larger pistols like the Glock 19 with no problems. Experiment and you will find something that works best for you. Carrying a pistol with a sharp edged rear sight has worn holes in both my clothing and my skin. It doesn’t make for very comfortable CCW, so when you are thinking about purchasing a pistol to carry consistently, run a thumb over the sights. You may want to purchase some aftermarket sights if you find the stock sights to be on the aggressive side. 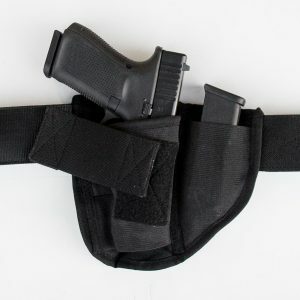 Not all holsters will be able to be carried in all positions so experimentation is key to find out the best one for you. 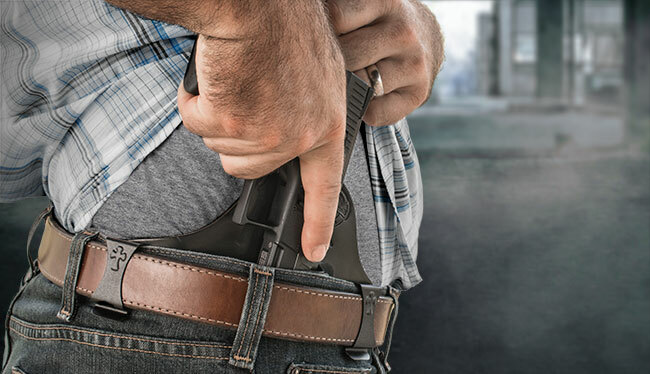 It’s important to consider what you will be doing while carrying concealed. For example: If you work at a desk or are a truck driver who sits for long periods of time, side carry might not be the most comfortable location. The safety belt and/or the seat itself could prohibit a smooth draw of the pistol. For this reason, some carry in other locations on their body, such as the ankle or appendix position. I find a simple Kydex inside-the-waistband holster with a belt clip to be the most versatile when it comes to positioning the pistol. The simple design and single belt clip allow the holster to be worn in a variety of positions on the belt. I find I get a better sense for where to carry after trying a location like appendix, or side carry, for at least a week or two. Less time than that doesn’t give you adequate time to get used to that position and test it thoroughly. I wear the Brave Response Appendix holster (in the appendix position) with an undershirt tucked behind and carry a Glock 19. I like to wear basketball shorts and sweat pants at home switching to jeans or slacks when going out. I used to carry the S&W M&P 9C 2.0 but found the rear sight to be too sharp. I plan to purchase aftermarket sights to fix this but until then I carry the G19. This is by far the most comfortable way for me to carry concealed and I find it works very well in almost all situations. Don't get me wrong, I still maintain other guns and holster setups as they have their uses, I just prefer to carry this way because of how comfortable it is. The Brave Response Holster uses it's own adjustable belt, which means I can wear clothing besides jeans and a belt, and still carry concealed. I wouldn't blame you for a healthy skepticism of a potentially biased opinion as Concealed carry.com does sell these holsters in our store. And while I realize this holster doesn't look like a marvel of engineering like some Kydex holsters do, don't let it fool you. If a CCW holster works like it should, no one is going to see it anyway. If you are in the market for a more comfortable way to carry concealed, I highly recommend giving the Brave Response Holster a try. What tricks do you use that I didn’t didn't mention? Let me know in the comments below. I pocket carry with a DeSantis Nenesis. It works great. I carry all the tiime, except at work, because of policy. If I felt I needed to change it for some reason, I’d look into Sneaky Pete holsters. As an instructor I always inform my students that each person must find what is comfortable for them. There are tons of holster styles and types out there and it does take time. If a person does not take the time to find what works for them then they are less likely to carry. I have found a holster company that I love and own 1 or more of every style they make. Their staff are also very helpful and take the time to talk to you over the phone. That company is Alien Gear. And just recently their parent company just recently opened Tactica Fashions for women. Once a person has found that right holster and way to carry, you won’t even notice it’s there. But be sure to PRACTICE that draw from concealment. As for what type of gun that is all the persons preference. While I love my Glock 19, I spend more time carrying my Glock 43 due to size and ease to conceal. Just remember, the only bad gun is the gun not carried. In essence, I agree with you and I know what you are saying about the importance of carrying a gun and having a holster that is comfortable. I would just add that the problem is that those asking questions like ‘what is the best holster or firearm’ have to be given a deeper answer than, ‘a holster that is comfortable’, or ‘a quality holster’ or ‘whatever gun they have a preference for’. These are the answers I hear given by many people quite often. As the topic experts, we need to give them context to those responses because there are holsters that are comfortable, but very poor in design. And there are carry positions that are comfortable but have many limitations. I also understand the thought behind the idea that any gun that is carried, is better than no gun at all. But this advice needs to be refined because there are some types of guns that are very poor options, and don’t really serve the intended goal of being a reliable tool for self-defense. The idea that a Ruger SR22 is just as good as a Glock 19 to use as an everyday carry a handgun, is not based on any statistical evidence, but rather an idea that ‘any gun is better than no gun’. And we all would likely agree that this is a bad choice. People don’t know what they don’t know, and if we just say ‘do what makes you comfortable’ we run the risk of them choosing gear/gun/carry combo that is based on their limited understanding, rather than information gathered over years of experience and understanding of all of the options available. Thanks for training the flock to defend themselves and keep up the great work. In regards to Sneaky Pete holsters, I have had good luck with them. They are easy to get on and off. They are easy to draw from. Over the course of several years, I was asked three times if “that is a holster”. And each time it was in my local gun range. I have never been asked while in public.